Frequent critics of the law for years, Rick Scott and Ron DeSantis are conspicuously quiet. Marco Rubio offers no solutions to what comes next. Three days since a Texas judge ruled the Affordable Care Act unconstitutional, outgoing Gov. Rick Scott and his successor Ron DeSantis remained silent on a decision that could affect the health care of millions of Floridians. The ruling was what both Republicans sought while in office. Scott, now headed to the U.S. Senate, staked his 2010 gubernatorial run by vowing to undermine the law from Florida's governor's mansion, a promise he made good on by thwarting the law's full implementation in the state. DeSantis, as a Congressman, voted to repeal the law over and over again. But now that the law's future is uncertain, Scott and DeSantis are conspicuously quiet. There were no news releases reacting to the decision, no commentary on Twitter. A third top Florida Republican, U.S. Senator Marco Rubio, has been a vocal critic of the law since he was elected in 2010. Since Friday's ruling, Rubio offered a statement that Congress must now find an alternative for Obamacare — eight years after he initially promised he would do so himself if elected. None of the three responded Monday when asked to elaborate on what comes next. Democrats, meanwhile, swiftly rebuked Friday's decision. "It's irresponsible and cruel for Republicans to rip life-saving health coverage away from American families," U.S. Rep. Kathy Castor, D-Tampa, said on Twitter. In his ruling late Friday, Judge Reed O'Connor of the Federal District Court in Fort Worth said that the individual mandate requiring people to purchase health insurance is unconstitutional, which led to him then invalidating the remaining provisions of the Affordable Care Act. If upheld, the ruling could affect the health care of 1.8 million Floridians who purchased insurance through healthcare marketplaces, most with the assistance of federal subsidies. Florida joined 20 states that sued to repeal the law after Congress voted as part of a broad tax cut package to remove the financial penalties for not purchasing insurance. The states said without this penalty, the law could not stand. O'Connor agreed. As fervor grew this summer of the healthcare law's uncertainty, Scott campaigned for Senate while distancing himself from Florida's involvement in the lawsuit. It was Attorney General Pam Bondi who signed off on the lawsuit, not his administration, he said, though he never called for her to back off. DeSantis, too, didn't say whether Florida should remain part of the lawsuit. On Monday, Bondi's successor, Republican Ashley Moody, said in a statement that she intends to continue Florida's involvement. "The decision affirms that the federal government overstepped legal bounds," Moody said. "People are frustrated that access and affordability of healthcare have not been solved by lawmakers, which I understand, but as I said during our campaign, improper and unconstitutional legislation undermines the strength of our system of government." 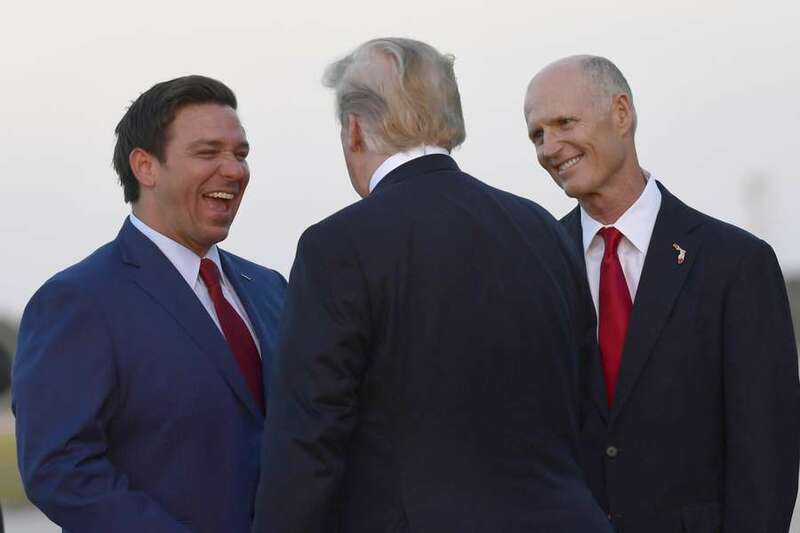 Despite years of undermining the federal health care law, both Scott and DeSantis on the campaign trail claimed support for some of its popular elements. Scott said Congress could pass a one-page bill to guarantee insurance companies can't deny coverage to people with pre-existing conditions, as they could before the Affordable Care Act. DeSantis has said if Congress doesn't move to protect Floridians with pre-existing conditions, the Legislature should. Asked Monday if they have plans to take those very steps after Friday's court ruling, neither responded. President Donald Trump on Twitter declared victory, though his administration acknowledged they expect the law to remain in affect while the decision is appealed. It is likely headed to the Supreme Court and could arrive on the docket just before the 2020 presidential election. The makeup of the high court is decidedly more conservative than when it upheld the Affordable Care Act in a contentious 5-4 decision. And while all five justices that voted to preserve the law remain, it is unclear whether that support remains after Congress eliminated the penalty for not having insurance. Trump tweeted: "As I predicted all along, Obamacare has been struck down as an UNCONSTITUTIONAL disaster! Now Congress must pass a STRONG law that provides GREAT healthcare and protects pre-existing conditions." Rubio in a statement over the weekend said Friday's ruling was a "stark reminder of the millions of Americans who are suffering under the law." When he ran for the U.S. Senate in 2010, Rubio became a darling of the tea party movement, positioning himself as the most anti-Obamacare candidate in the race. "I'm the only candidate in this race who has opposed ObamaCare and vowed to repeal and replace it with a real reform plan that will lower costs, allow people to keep the coverage they have now and give individuals the same tax breaks businesses get to provide health care insurance." Yet by Monday, Rubio had provided no answers for what could replace the law. Rubio said Congress "should look at opportunities that give families flexibility in obtaining healthcare while also allowing states the ability to innovate." Asked to clarify what those "opportunities" might be, a spokeswoman for Rubio did not respond.